Sun is shining, the weather is sweet! Bob Marley said it best, we’re in the heart of spring approaching summer and the days are long and beautiful. With these blissful days of sunshine comes the need to protect your eyes from the sun’s damaging rays. Luckily, there is no need to sacrifice style to stay protected thanks to one of our most beloved accessories - sunglasses! I sat down with ophthalmologist Dr. Duranda Ash at the Ash Eye Institute in Nassau to learn how to best protect the eyes during the summer and of course the rundown of the hottest eyewear trends for 2012. Unfortunately, our eyes are one of the parts of our body we often neglect to pay attention to until something is wrong - and typically by that time irreparable damage has been done. One way we can safeguard these ever precious windows to our bodies is to consistently protect them from sun damage by investing in great sunglasses. The perfect pair of shades will do double duty - giving you optimal sun protection and simultaneously making you look like a movie star. Here are the top 6 trends in eyewear this year. Any recent photo of Beyonce in daylight has more than likely captured the starlet in one of her newest favorite accessories - circular lenses by Linda Farrow for The Row. This vintage style is making a strong comeback both on designer runways and on the street with everyday fashionistas. Want to channel your inner John Lennon? This style is perfect for those who have an oval, triangular, diamond or square shaped face. Aviators are here to stay so if you’ve been hesitating to snag a pair, resist no more. Ideal for those with an oval shaped face. 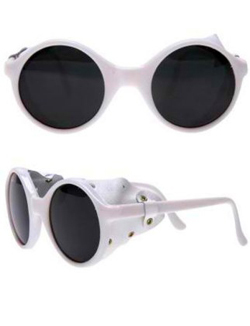 Channel your inner 1960’s vixen in a pair of retro-chic cat eye sunnies a la Marilyn Monroe. Perfect for those with oval, inverted triangular and square shaped faces. 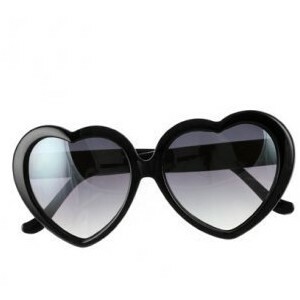 The last time I can recall wearing heart shaped sunglasses I was still wetting the bed at night, however quirky shaped sunnies are all the rage for 2012. Heart shaped versions top the list in this trend best suited to those with an oval shaped face. Celebrities that have rocked this trend include Mick Jagger, Nicole Richie and Katy Perry. Gradient lenses are one of my favorite eyewear trends this year. Au courant yet timeless, a subtle gradient lens adds a heightened level of sophistication to your favorite shaped frames. Sunglasses with a bold frame and contrasting lens are chic this spring and summer. Choose a style that works best for your face shape and rock this funky trend that will add interest to even the simplest look. Invested a pretty penny in your sunglasses and suffering from separation anxiety every time you take them off? Not to worry! “You should wear protective eye wear even when the sun isn’t out and the sky appears overcast” advised Dr. Ash. Ultraviolet rays can go right through clouds, making it essential to protect your eyes even when you cannot feel direct sunlight. The sun’s rays are strongest from 10am to 2pm so ensure you have your sunnies on hand to shield your eyes from those harmful rays. The ASH Eye Institute has a stellar selection of designer sunglasses to choose from with locations in The Southwest Plaza in Nassau, 29A West Mall Drive in Freeport and Auskell Medical Centre in Abaco.